« Is Anything Too Hard for God? Abraham pleaded for Sodom and Gomorrah, that God not destroy them if ten righteous people (those doing right), could be found. And God agreed. It only takes a few to save the many. Jesus turned the world upside down with twelve disciples. These twelve were dedicated, who brought with them, their families and their neighbors and their friends. They touched lives and then those people touched lives. And today, we are the fruit of those twelve. 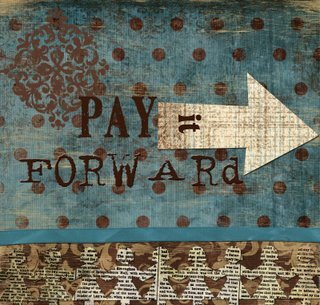 In the movie, Pay It Forward, a young boy, in response to a school assignment of coming up with direct action that could change the world, he devises a simple plan of helping three people with good deeds (things they could not do for themselves) and then challenge them to do the same. Exponentially, the impact would be as great as the disciples’ challenge, a charitable pyramid. Sometimes, I see myself taking no action at all because I feel so insignificant in the face of our world’s despair. It is hard to remember the value of saving one, of helping one, of changing the course of a single life. It is indeed like the story of the boy throwing starfish back into the ocean one by one. An old man, who sees him, tells him how many will be lost and what difference could he possibly make, the beach was strewn with dying starfish. Yes, but the boy reminded him, he made a difference to that one, the one or few that he was able to throw back into the saving waters. It is unlikely that I will be the next Billy Graham, speaking to thousands of a hope in the midst of despair, but I could be a friend to one more. I am not comfortable with people whose lives are a shambles. Their troubles are so overwhelming. I want to tell them how to fix it, to do this or that. But I have seen their inability to act. How do I befriend such a one? It’s a trust issue I think. I have to earn trust and then, perhaps, there would be an opening for more than just a temporary fix. Jesus did not heal everyone, but he was present for them all. He did not feed everyone but he gave an example of how it could be done. He did not change the financial circumstances or status of individuals, but he gave them a better way of handling their situations. Except for the twelve, and the women who followed as well, those lives he changed forever.